Discussion in 'Mayberry Lounge' started by Satsui Ryu, May 21, 2014. Or whenever the last day of your work week is? During the week I am just go go go, but come Friday night I have trouble staying up past 11 and sometimes 10 is a challenge. Its like a weekly adrenaline dump. Maybe its just becoming old and lame but at one time I would get my wind late night Friday and be ready to do something. I haven't had a regular schedule in over three years, but when I do have more than a day off after doing a good stretch, I usually start those days off with a good and early sleep. sure.that's why you go to happy hour and get hammered till like whenever then drive home and go to bed. 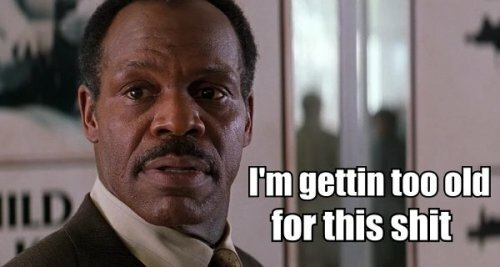 Sorry buddy, but you're very clearly approaching Murtaugh status. Seriously though, I used to be able to drink my face off and go to work on two hours of sleep, no problem. Get off, start over, and handle it like a champ. Nowadays, I'm washed up after a night of heavy boozing, and need a full day of recovery time in order to be of any use to myself. If you don't have enough steam to go out and chase tail on the weekends, yea, you're getting old mang. I do that anyway, Friday or not. no. friday is getting hammered day. same as saturday. most fridays i look forward to hitting bed early and waking up early sat and hitting the gym hard. The days i do go out friday, i wake up hung over saturday and i'm a lazy sack of potatoes wishing I'd gone to bed early friday night. When I'd visit vegas for the weekend I'd usually go thursday-sunday. I now just go friday-sunday and I don't even know why, if by saturday evening i'm destroyed and useless. Last time I ended up staying in the condo sat night with the GF and friends just having some beers we were so wiped out. If I go out during the week, that means no gym the next day and zero productivity at work. I'm 31 and I crash hard on Fridays. I'm pretty much a vegetable by 10 pm and honestly I don't even care. The juice ain't worth the squeeze anymore. My weekends tire me out. I recuperate during the week. Therefore I usually feel best on Friday. Yeah. I try to stay up late, then end up passing out on the couch watching netflix. My schedule on Fridays is usually pretty light at work. I make a point of not scheduling client calls etc on Fridays. By about 10, I'm ready to go face down. It's ok though because I like getting up early on Saturday morning. I actually don't, I usually go out friday nights but last night I was exactly how you described TS. I was just drained and I was in bed by 11 I think, but for a while before that I was fighting to keep my eyes open. I guess it was a long week. I've been eating at my boss' house every Friday for a while, but on the weeks I don't go I actually go to bed earlier than on a weekday just for the fact that I'm glad the work week is over and Saturday I'll have hardly any work (I'm on call) and lots of relaxation. Depends, if I'm heading for drinks straight after work I'm usually pretty exhausted by 10 or 11. Figure I'm at work at 8 am, it's a long day. If I head home, unwind a bit then meet up later I've got more stamina, though 5 hours of drinking still slows me down. I would go on crazy benders back when coke ams Molly were accepted and commonplace in my social circle. I'm happy to be over that.